LEGO released a new kit with a female astronomer, chemist and paleontologist on Aug. 1, 2014. Any space fan that hasn't already purchased a newly released LEGO kit featuring a female astronomer will have to wait a while longer before getting their hands on the toy. The initial supply of the brand new "LEGO Ideas Research Institute" sold out on Aug. 1, the same day it was released. 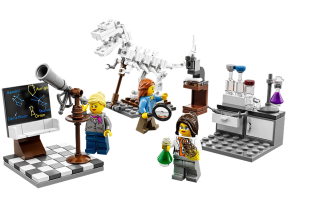 The $20 kit features a female paleontologist and chemist as well as the astronomer. It also comes with some pretty sweet LEGO gear, including a fake mini chemistry and a LEGO dinosaur skeleton. The astronomer comes equipped with a sky map and telescope. Geoscientist Ellen Kooijman developed the new set, and LEGO Ideas members selected it.